This information is brought to you by Benchmark Animal Health makers of Mydiavac. Benchmark's sheep being vaccinated with Mydiavac at scanning. 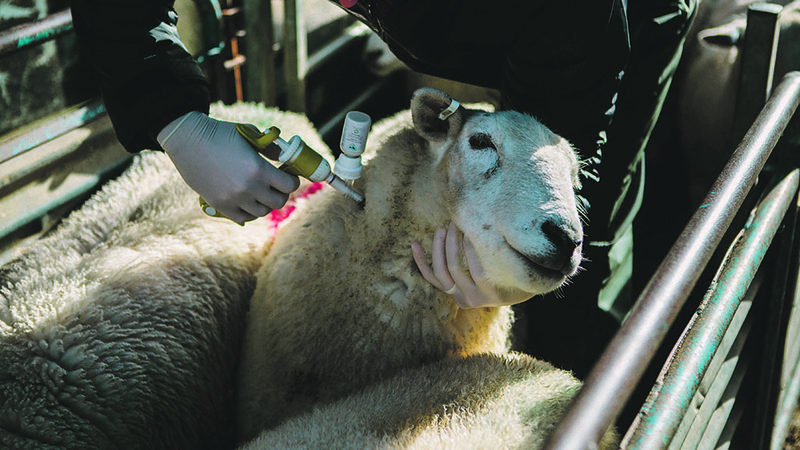 THE first step towards implementing a control programme for EA is the close monitoring of any abnormal signs during lambing time, says Matt Haslam, an in-house vet with Benchmark Animal Health. The disease, which is also known as chlamydial abortion, is the most common cause of abortion in the UK sheep flock and is believed to be responsible for about half of all cases. Accurate record keeping is very important, particularly on large units, where several people may be involved with the ewes at lambing time,says Mr Haslam. Details of any late-term abortions, stillbirths and weak lambs should be noted, along with ewes which fail to cleanse properly. I would suggest a maximum threshold figure of 5 per cent for aborted lambs is applied, although 2 per cent would be ideal. If numbers exceed this level, the farm vet should be contacted immediately, to conduct an investigation. There are a number of pathogens which cause abortion in ewes and it is crucial to know which one you are dealing with, to ensure that treatment is successful. Two aborted lambs out of every 100 may be accepted as natural losses on farms with large flocks, but if EA is the causal agent, the number of deaths will be much higher the following year. This information is brought to you by Benchmark Animal Health Ltd. makers of Mydiavac. And there are other factors which make EAE hard to control, he adds. Producers can help to increase the accuracy of diagnosis, by retaining dead lambs and preserving samples of afterbirth from suspect ewes. Specimens should be stored in a clean container, before being sent to a laboratory for testing. However, individual vets vary and some may offer a diagnosis, after making a visual examination of infected material, he adds. EA does not follow the same pattern as many of the other disease-causing pathogens. A naive ewe which is exposed to infection when she is less than 14 weeks in-lamb will not be affected during her current pregnancy, he says. The disease will lie dormant until the date of her next lambing approaches, when she is likely to suffer abortion and retained cleansing. In addition, infected ewes do not shed the harmful bacteria until two to three weeks prior to lambing and over the lambing period. The disease is transmitted when a naïve animal ingests EA bacteria which are present in aborted lambs, infected placental material and vaginal discharge. There is no routine test available and diseased sheep will appear normal. The bacterium responsible for EA causes inflammation of the placenta, which in turn restricts the supply of nutrients and oxygen to the foetus. The disease is characterised by an inflamed placental membrane, which is reddish brown in colour and may appear thickened. By contrast, symptoms of abortion due to toxoplasmosis can cause the cotyledons linking the placental membrane to have a white, frosted appearance. Ewes with EA will usually exhibit the classic signs of abortion, unlike the mummified foetuses typically associated with toxoplasmosis. The sharp increase in the number of lamb losses producers will experience, if their sheep become infected with EA, is not the only way in which the disease affects farm profitability, Mr Haslam points out. A ewe which aborts her lamb will not cleanse efficiently and has a high risk of uterine infection, which will reduce her future fertility. There are a number of EA vaccines on the market and with one exception, these are live versions and therefore restricted to the period when ewes are empty. As the only de-activated version of the vaccine, Benchmark’s Mydiavac can be given to pregnant ewes. This flexibility means Mydiavac can be used as a treatment, in the event of an abortion storm. Swift action will raise the level of immunity on the flock and limit the damage caused by the disease not only at the current lambing, but also during the following year. After treatment, it will take about four weeks for the sheep to receive full protection against EA. “It is worth noting Mydiavac will not prevent the spread of toxoplasmosis, another common cause of abortion. That is why correct diagnosis is so essential, for treatment to be effective. As with any infectious disease, a high standard of cleanliness and good biosecurity will also go a long way towards keeping the flock disease free. Despite the complexities of the bacteria associated with EA, flocks can be protected by the routine vaccination of all female replacements. Mr Haslam points out producers with an annual replacement rate of 25 per cent can raise the health status of their flocks within four years, if this policy is adopted. He also advises anyone who regularly buys-in replacements to limit their purchases to vendors who vaccinate their sheep against EA. While one of Mydiavac’s strengths lies in its flexible administration period, the ideal time for vaccination is pre-tupping. This is the least stressful time for the ewes, as they are empty and on a rising plane of nutrition. EA has a negative effect on sheep welfare and can result in heavy financial losses, says Mr Haslam. It is also very demoralising for producers who have spent all year trying to keep their flocks healthy, only to be faced with aborted or dead lambs and sick ewes at lambing time. Fortunately, we have a vaccine that offers a simple and cost effective solution to the problem. Eblex calculations, based on vaccinating replacement females against EA, show a £10-plus cost benefit per ewes put to the tup, assuming an estimated 10 per cent incidence of abortion caused by the disease. This information is brought to you by Benchmark Animal Health Ltd. makers of Mydiavac. Always consult your veterinary surgeon. Use medicines responsibly.